Writing Wizard 3.0 is released today, and it's a good time to look back at the story of this successful educational app. 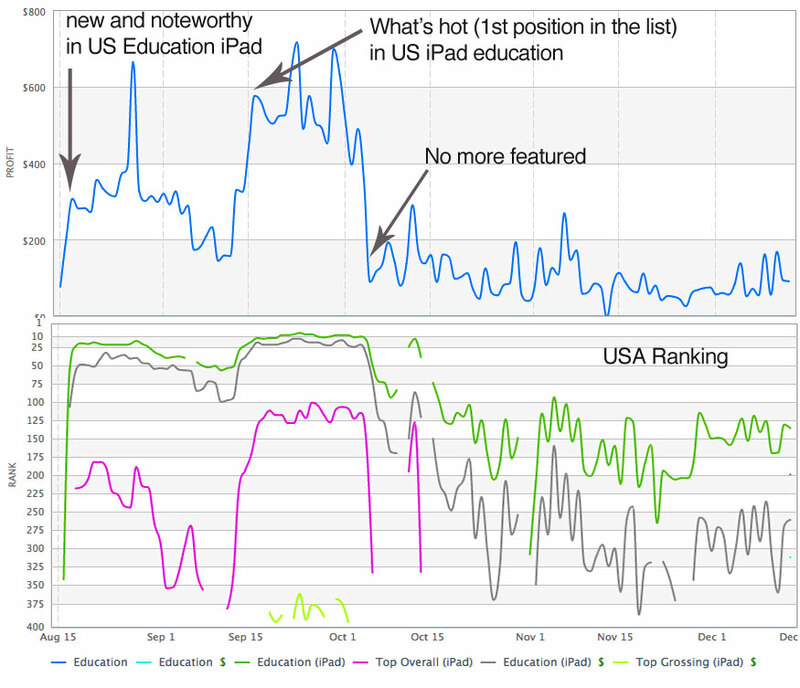 As you can see, it was not easy to get the initial traction even if I had already a good user base from my others apps, and that the app was featured in the App Store Education category (kids category was not existing in August 2013) and in many reviews sites. But as for any product, if your app is great, that people like it, need it and use it regularly, words of mouth/ recommendations will help your app to stay afloat. To make this happen, you need a happy user base and it may be difficult to get this. For this app, the trick was to put the app free for a few days with the help of influential web sites (including educational reviews sites that gave 5/5 to the app). A little help from the App Store is, of course, very useful as well as some marketing, even if nowadays it is more and more difficult to do marketing because the market is so crowded. Tracing apps are tricky to localize because it seems that each country uses a different font (or even several fonts). Adding a font in Writing Wizard is not as easy as dragging a font file because I must create the entire font manually, so provided fonts are limited but it seems that a lot countries are happy with one of the provided font. Since v2.0 had 3 fonts specially made for the US and I do most of the marketing in the US/English market, it's not a surprise that the US is the biggest market. However, UK market is really good as well, and that's why I included a new font specially made for this country in v3.0. I also added a font used in Scandinavia because Swedish people love my apps. I wanted to add a new font for Australia and another one for the US but I didn't have the time to do it (next update...). The app is localized in German, Spanish, French, Italian and Swedish. However, except for Sweden, these countries are less interested in learning to trace print letters because kids mostly learn to write cursive/linked letters. In addition, it always difficult to get traction in a country where your brand is not recognized which is the case in Germany, Spanish-speaking countries and Italy. On the other hand, I released another version to learn to trace cursive and it's working very well in France and in the US. Since v3.0 allows to share word lists, the App Store need an option for 6 stars ! So the app ranking average is about 50 in iPad Education. It seems to be sticky now even if lastly it seems that the search algorithm has a little bit changed and sometimes the rank is going down for one day or two. My cousin took the decision to port the app on Android because it is really successful on iOS and there is no app like this on Android (OK there is no app like this on iOS too, but that's not the question...), and we decided to split revenue. Results are not fantastic but we hope that the market will be better in the future. Most of the kids apps developers that release both on Android and iOS will tell you that they make between 10% and 20% of their revenue on Android. If we compare downloads (price is not the same on iOS and Android) , 10% of Writing Wizard sales are made on Android (13% if one doesn't include school purchase on iOS). Ranking on Google Play Education US is around 100 - So it can be better, we need a way to get more visibility. So when you've got a successful app that people love, you have to release update. Updates don't mean that you will sell more apps but it is a good thing for long term sales. People are happy that you add new features (for free!) and they will recommend your app even more, and it helps to reinforce that your brand is taking care of its apps. In addition, it's even more complex for the competition to catch up. 2014 has been a pretty good year even if I didn't release a new educational app - yes, I know, I wrote in the 2013 report that I will release two edu apps in 2014 but my plans changed a lot ;-) . So why there is more profit than in 2013 without releasing a new app ? It's mainly due to the success of Writing Wizard and Cursive Writing Wizard since all others apps are selling less than in 2013 (20% to 30% less). Note that the cursive app was released end of 2013, and the update supporting US font was released in February/March. I've got a good educational apps portfolio and I believe cross promotion is working pretty well - even if I don't have precise numbers. The market is still growing. There is more competition, but also more money. Countries: I've localized apps in French, Swedish, German, Dutch and Spanish. It is now very hard to enter the market if you don't have a great idea and can't invest a lot of time to develop your new app - I would say that 4-6 month/man is a minimum, and only if you already got a good experience in apps for kids. If your app doesn't shine, it will be really difficult to be visible. Visibility is really hard to get these days. And even with some visibility at launch, there are a lot of apps which revenue are shrinking very fast. So, most full time indie devs now have a lot of issues. Previous apps revenue are low and it's difficult to invest in a new app. Most devs that are profitable are the ones that did the same thing as I did: create few apps, but really great apps that users loves. However, I'm sure that some found very specific niches and are profitable because the competition is lower in their niche. So being full time dev is really not easy even if you have already some good apps. In 2014, all my english apps were at $2.99. But some established apps have a higher price and good ranking/revenue. I think that when people know that an app is great, they are OK to pay for it. As for all kind of product, people are OK to pay for quality - but they must know, in a way or another, that they buy quality. So since Writing Wizard has a large and happy user base and rave reviews, I changed the price of Writing Wizard to $4.99 two weeks ago, and the result is, so far, pretty good (about 20-30% additional revenue). As I noted last year, subscription model seems to work pretty well for some apps (Learn with Homer, Top IQ Agnitus,...) but all of these apps have a lot of content, so it's difficult to use this model when you're an indie. However, I'm still wondering if this subscription model can work for apps that are targeting on one subject like my apps do. Surely you also need to offer something regularly to your subscribers which is not easy. I went back from the Dust and Magic AppCamp and WWDC with a new idea. I wanted to use the new iOS8 SceneKit framework to do something in 3D. So I thought "I'm gonna take 2/3 weeks and release it for the release of iOS8 in September". In the end, it took me more than 2 months, but it was really fun and put me away of doing updates and marketing (updates and marketing are not the funniest part of my job, I really prefer doing new apps but from a business point of view, it is of course important). It is far from being a perfect app because I did not have time to polish the user experience, and it is also a useless, but fun, app, and there is not really something educational. It allows you to draw shapes in 3D with a lot of settings to tweak the rendering, and to move around in the 3D space. Here is the video demo. So I experienced what it is to release a useless small app with not consumable IAPs. All the features of the app were enabled except the possibility to change shapes, and it was possible to buy 6 shapes for $1.99. It had some visibility because it was featured on the App Store (thanks to SceneKit and iOS8 usage I think) just after the release of iOS8. In the end I've made $1.3K with the app, almost entirely when the app was featured. Not very good for 2 months of work but, honestly, I knew that it was not going to make money - the most important is that it was fun to do ! Android - is it profitable ? My cousin has ported Writing Wizard on Android and it has just been released. As he's rather a perfectionist he did a very polished port. He used Apportable since the app was developed in objective-c and cocos2D. He has to port the app in cocos2D V3 and rebuilt all the UIKit part. In the end, it took at least 3 good months (the UIKit port was not super easy). Anyway, the app is now released and we're gonna see what an educational app selling very well on iOS can do on Android. I'm doing the marketing right now but it seems even more complex than on iOS. I don't really know how to reach people on Android ! We decided to do a paid app and a free to try demo (not yet with IAP because of the lack of time). I believe it can sell very well on Android (let's say 20% of the iOS revenue), but it is the marketing that is not going to be easy. For 2015, I think I've got a good idea for a new educational app, but I'm not sure it will be very profitable because it is not targeted for young kids (which seems to be the bigger market). I will focus on innovation and very good execution and we will see. I've got the chance to be able to try to do more challenging apps because I've got good recurrent revenue, so I will do it. But of course, I will also do updates, and also try to release a Japanese version of Writing Wizard. My cousin has also an app idea - so we will see what's happen in 2015. See you in one year ! So after my 2011 and 2012 reports. Here's my 2013 report about my sales and experience as an indie educational iOS app developer. I hope you can find some valuable information. For those who read this blog for the first time:I've made such reports since 2011 to share my experience with other indie app developers who want to understand the market (2011 report , 2012 report ). I started creating apps after reading similar blog posts that reported their experience and sales, and I feel that it is my turn to share my experience. I'm a full-time French indie dev, and I started creating apps in 2010 when the iPad was released. I have 2 adorable daughters who are homeschooled, and it was clear that the iPad was going to be successful with my kids, even if - as most of us - I didn't think that the market would grow that way. We've got a lot of educational materials at home, mostly Montessori, and I usually get my ideas from these materials and then add all the magic that touch devices can add to enhance these materials. So cumulative sales since 2010 are beyond $1.1M. Amazing. I really didn't think sales could be so nice when I released Montessori Crosswords in 2010. 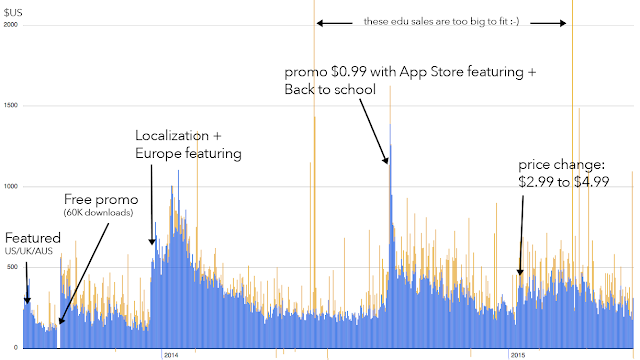 Since I released Word Wizard in August 2011, sales have increased about 5-10% per year although I only had 2 apps in 2011 (plus 2 French localizations), and a lot more now (4 apps in English and a lot of localized apps). The good news is that releasing one quality app per year, some updates and localizations allows to keep and even increase a little bit my revenue. I always feared that the competition (especially big players and funded startups) would "eat" the market. I think that it is partially true, but some facts are helping me: the market is bigger and bigger, and a lot of people - including Apple when it features indie apps devs - help to spread the word about good indie apps. In addition, I've got a very good user base who love my apps and recommends them. Compared to 2013, sales have increased by 5%. This is partially due a very good January month (Montessori Numbers was featured during this period) and the good sales of my new app. We can see the same pattern as in 2012 : strong January and February (supposedly due to iPads gifted for Christmas), then sales decreases progressively until back to school where sales restart - I believe it is the same for everybody in the educational apps category. 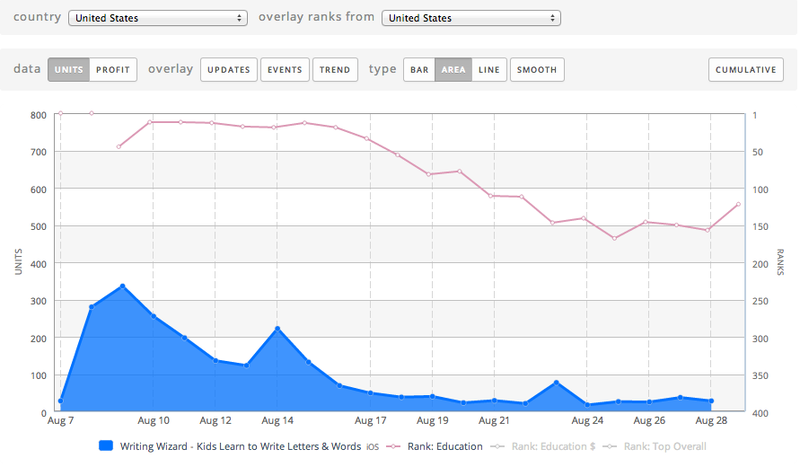 It's interesting to see that my first 2 apps (Montessori Crosswords and Word Wizard) are still the best sellers. Still the same conclusion as last year: if you've got an app that people love and a good user base, it's a recipe for success. But don't forget to update your apps so that they stay alive. For example, Montessori Crosswords has not been updated since more than 1 year and I believe it is partially why sales are going down. I don't know exactly why Montessori Numbers has not performed better. My new app, Writing Wizard, has been very well received and I think it will be my best seller next year. I've got a lot of bulk education purchases so if you check the rank of my apps in 2013 you may not have a correct relation between revenue and rank, because educational purchases are not taken into account for the rank of the app. Another interesting figure is the last column that represents the educational purchases made by schools. It is just a little bit better than in 2011, but I believe this market is really bigger this year. However, it is the same as in the "parents" market : so many more good apps are available now. Anyway, I really like these purchases because it means that my apps are good educational apps. Note that I don't do discounts for volume purchases (except if somebody asked to do it because they don't have enough budget) because I think 3$ is really cheap. I believe the discount exists for more expensive apps. As usual, I did have a very optimist roadmap and I couldn't do all I wanted. I wanted to do a new app for back to school, updating Montessori Crosswords and release a new app for Christmas. 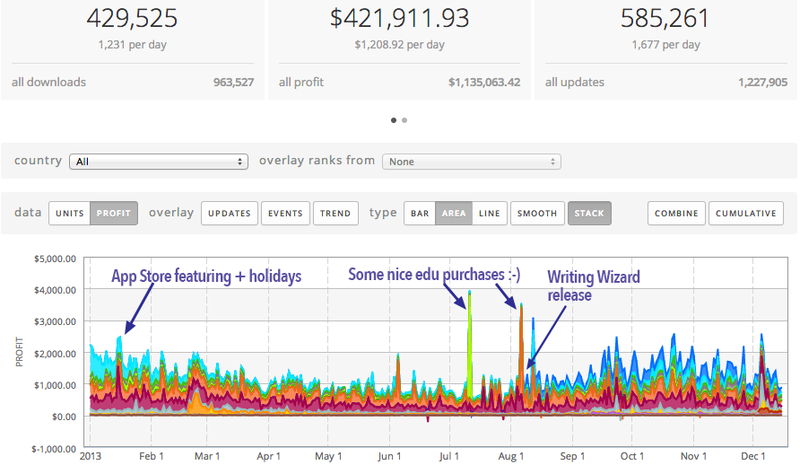 I only released Writing Wizard and made some localizations (as previous years actually…). I release one polished app every year, and in 2013 I decided to enter a very crowded market : apps that help kids to trace letters. The tracing feature I've added to Montessori Numbers for Christmas 2012 was very well received - people were happy and Apple featured the update - so I decided to do an app based on the same tracing engine with new fun features. After analyzing the market, I found that there was no apps that do everything well. Some apps were very nice and fun (e.g. LetterSchool) but lacked from settings to customize the app to suit every child's needs as well as reporting features which are important for parents and teachers. Some apps did have more features but were not fun enough to keep kids motivated. However, sales were good but not fantastic at launch - maybe owing to the fact that a lot of people already have tracing apps and it is more difficult to sell this kind of app, or because it was released too early. As usual, as soon as the app was no longer featured (or less visible), sales began to decrease. Everybody was loving the app and I knew that all I needed was to spread the word a little more. So I decided to set the app free for 1 or 2 days with the help of MomsWithApps AppFriday. I also contacted all bloggers I know, and mid-September there was 60K free downloads in 2 days which pushed the app in the top 30 paid education in the following weeks as you can see in the graph below. You see the spikes in the graph ? It is educational purchases made by schools... So, again, don't make easy correlation between rank and sales because educational purchases are not taken into account for the ranking. This week I release an update with a new pre-writing activities section, iPhone support (and some Christmas stickers!) to keep the app alive and hopefully get some visibility. We will see if it helps to boost sales once again. It is also localized in 5 European languages but in most of these countries, kids learn cursive so I don't think it will be a hit in these countries, but I needed to do it because an international cursive version - based on the same engine - will be released next year. I have localized Word Wizard in Dutch and Montessori Numbers in Swedish. It usually took one week and a little bit of money to localize an app. It is usually profitable but the problem is always the same: visibility. It is not easy to market an app in a language you don't speak. Dutch Word Wizard was featured in the Dutch App Store and sales were pretty good but now it only sells a few units a day. It is the same issue than in the German market (I did the German localization last year). If you don't have a very good user base or do very good marketing, it is difficult to enter a local market (in addition it is difficult to evaluate the quality of the app even if you ask native people to test it). Swedish Word Wizard sells very well and so I believed it was a good thing to localize the numbers app in Swedish (especially because there are also people who help localize the app for free and a blog, pappasappar.se, that helps spread the word about good apps for kids). It is not a big hit but it is profitable. Android sales are not very good compared to iOS. Most people report that iOS sales are 5 times better, and it's almost the same for me. I've got only one app Montessori Words which has been ported by a friend of mine (it is Montessori Crosswords without the crosswords feature ) that is rated 5 stars on Google Play but revenue are about 40$ a day (25$ on google play, 15$ on Amazon…). Note that the app ranking in US education is around 110 and the app price is $2.99, and that there is a free/lite version to try the app. I receive more and more mails from people asking me if my app are on Android. So it surely means that the Android educational market will continue to grow, but I don't have enough time to port my Android apps and I prefer to concentrate on iOS. Perhaps I should use a cross-platform framework (e.g. Unity) for my next app so I can release easily on several platforms - but I really like Xcode and objective-c ! Free with non-consumable In-App purchase (IAP) is an interesting option. It allows people to test the app and buy it if they like it. I wanted to do it for my new App (Writing Wizard) but eventually I didn't do it because I want to be able to set it free sometimes to promote it, and also because schools can't buy IAP. Perhaps a good alternative is to create two apps: one free with IAP and one paid (but I don't know if Apple is still OK with this). Most of big publishers don't use IAP (Disney, Nickelodeon, Toca Boca) but I think it may change in the future and they are doing some experiment (like Disney Princess). Endless Reader (the follow-up to EndLess Alphabet) is free with IAP and performing very well (others examples performing well are Learn With Homer and Agnitus). If you look at the top grossing educational charts you will see that it is mixed between paid and free with IAPs apps. An interesting experience was how Originator's Endless Alphabet was marketed. It was all about pricing. They released this excellent app as a free app for several months, then moved to $4.99 (or more, it is now $5.99). This way, they did get a huge user base and when they moved to paid, they were directly in the top 10 paid education. Note that it works only if you have a very very good app (so that people talk about it) and you are promoted in a way or another (in their case a lot of featuring on the App Store). Another interesting company is Motion Math which try several models : free+ IAP, paid + IAP to get more levels, and pro versions without IAP for schools. Some apps (Reading Rainbow, Agnitus) that are performing well are using a subscription model (user pay every month automatically). However I personally don't really like this model even if it seems very profitable. It looks OK if you add contents every month but it is not the case for all these apps as far as I know. The big change this year is the new Kids category on the App Store. Now it is the main place where parents go to find apps for their kids. Before it was the Education category but "Kids" is more explicit and offers filtering by age. Note that the Education category link on the App Store main page has been replaced by the Kids category link which helps a lot to push this new category. My apps were not in the Kids category at the beginning because I didn't realize it was so important. Actually I was afraid losing all the good reviews on the App Store by releasing updates - an update was needed to be in the new kids category, but when you release an update you loose all your ratings and reviews. Anyway, it was a huge mistake and now all my apps are in the Kids category (and some were featured in a special Montessori section, and it was very good for sales). The "pure" educational market is not yet invaded by big publishers ("pure" means that the app is targeted to learn something in Common Core State Standard…). Most of them (Disney, Nickelodeon, Toca Boca,..) are doing games but do not focus on "pure" education app - they have some educational apps but it is not their main goal. I believe it is simply because there is more money in games. On the other hand, big publishers are now releasing a lot of apps (check the front page of the Kids category) and they are always featured on the App Store. So it means a little bit less visibility for indie apps, but Apple still cares about small developers creating good apps, and some of us are regularly featured. But there are of course more and more "pure" educational apps that are better than ever. Indies, small publishers or funded startups are publishing great apps (Originator's Endless Alphabet/Reader, Artgig's Mystery Math Town, Tinybop's Human Body, Learn With Homer, Agnitus,…) So now if you want to enter the market, you really need to create a great app or you will be invisible ! So I hope that 2014 will as good as 2013. My cousin is going to work with me part time (we will share royalties on an app that he will develop) so perhaps L'Escapadou will release 2 new apps next year. See you next year and have a wonderful end of year ! Note: All figures are coming from appfigures.com , a very good tool to analyse your sales…which would be perfect if they could add a button to exclude educational sales in their figures. It’s been more than one year that I wrote “How I've Made $200k in the iOS Education Market” post which has been well received by the indie community (it was ranked #1 in Hacker News! ), so I think it’s time to make a follow-up and share my 2012 experience in the education market. For the background, I’m a french full-time indie dev that started doing educational apps when the iPad was released. I decided to go in this market because with my wife we decided to homeschool our kids some years ago, and I believed that the iPad would be a great for kids to learn and be creative. In this article, I talk about my sales, strategy, marketing but also on the education market in a broader view and what did change this year. The goal is show some data to understand what is happening in this market, and help/inspire others indies to take smart decisions. 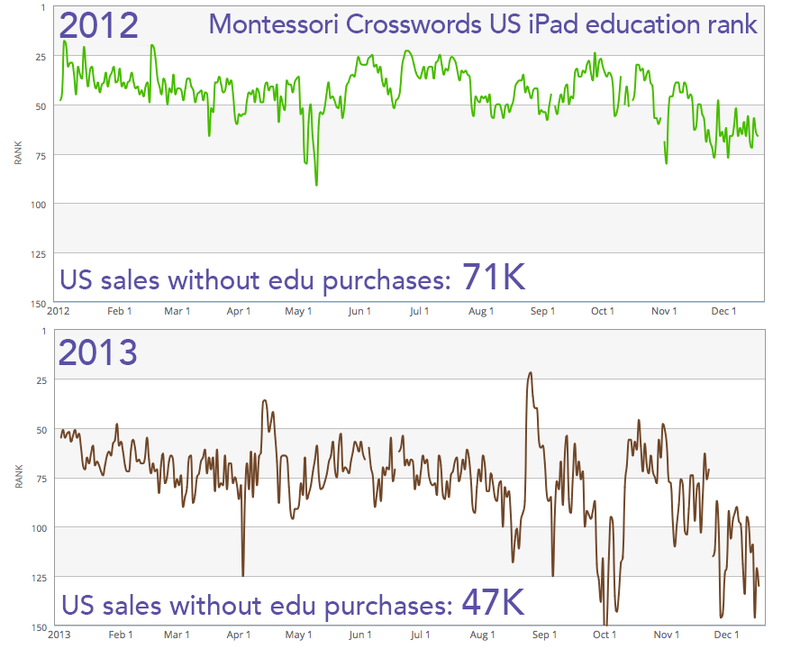 So let’s start by a sale graphic (all graphics are generated via appfigures.com ) to see what did happen since 2010 when I release my first app Montessori Crosswords. So it’s really great. When I started 2.5 years ago I really didn’t think it was possible to make so much money in the iOS education market. Fortunately, the iPad market has exploded and people have realized that their kids can learn on the iPad while having fun. One year ago -when I wrote the first article- I was really skeptic that I would be able to maintain such income especially because it is very difficult to stay visible when hundreds of apps are released everyday, but since the market is growing I think it compensates the loss of visibility. 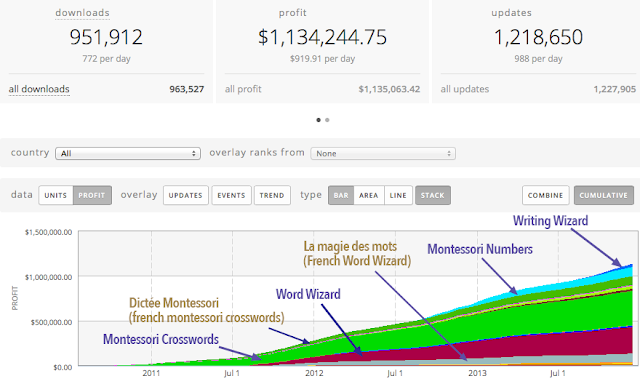 So my first app -“Montessori Crosswords” - is still the most profitable, and I haven't done a major update for at least one year. I think it is what happens when you create a well-received app that has a large user base (149K units sold so far) : the word of mouth works (and also Apple keep it in its education list). There is a kind of inertia that keeps your app from disappearing from the charts. The result is that it is usually ranked between 40 and 60 in iPad education. I think that there is also a kind of inertia for Word Wizard (94K units sold), because sales are more or less stabilized. Here are the iPad ranking of both apps to correlate sales with ranking - but note that rankings are not influenced if a school do a volume purchase (and there is a lot of them in the US - see below). So it’s nice to see that 27% of my income come from apps that are not in English, but almost exclusively from France where I live, and where I started to release apps in 2010 (first to market is always very important). France is a small market compared to the US, but since my apps are usually in the top 10 education it gives good results (from memory it seems that the french educational market is 10 times smaller than the US one). In addition, it seems that cross marketing is working better in France. For the record, my french apps are usually ranked between 100-150 on iPad overall. So from a strict profitability point of view, I think it would be wiser to spend less time creating localized version and work on a new English app (except for french apps of course) because it's easier for me to be visible in the US. But I’m still believing that it can be profitable can be successful in some countries if it is well marketed, and I will release a Dutch Word Wizard version soon. You can read more about my localization issues in this post. I also made an effort to add English and Australian voices in my new app (Montessori Numbers and Word Wizard) but it does not make a big difference for the moment (except for the new Australian voice in Word Wizard 3.0). I decided to add an Australian voice because some people asked for it, and it was pretty easy to do it (but for Montessori Crosswords it was too much work and I did not do it). 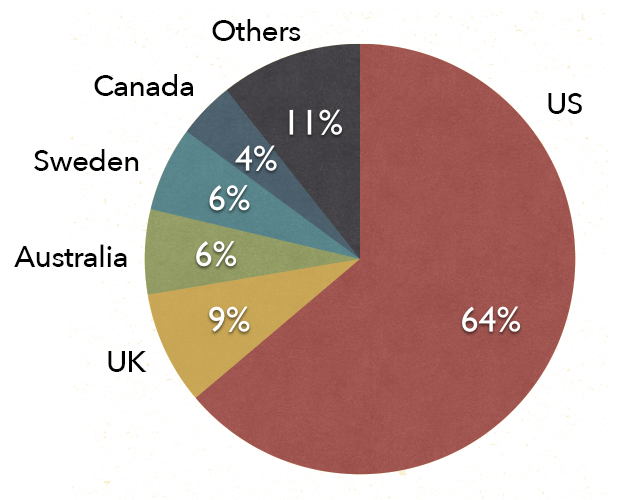 For the record, here are the details per country (for 2012). As you can see in the previous graphic , the good news in 2012 is that purchases made by school have exploded (in the graphic, the last column is the number of educational purchases) . 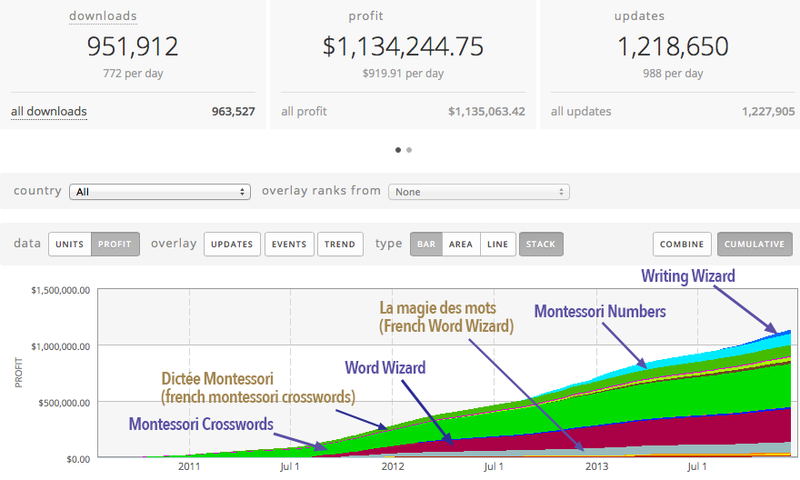 Actually 36% of Word Wizard purchases in the US have been made by schools in 2012 (23% for Montessori Crosswords) ! Canada has also started to buy apps at the end of 2012. Note that these sales are not taken into account for the ranking in the app store. Like every year, I released an educational app beginning of August. This time, I wanted to tackle how kids learn numbers because my 6 year old was beginning to be very interested in numbers. We are a homeschooling family with a lot of educational resources and, one more time, when I checked all the resources we have, the Montessori material was the best and I decided to add some magic in this material in an iPad version. It was very fun to do and I was very happy with the result. The app was very well received : featured by Apple in education category for more than one month, it received a design award from Children’s Technology Review, 5-stars reviews on several blogs, got an nice article in Wired’s GeekDad about all my Montessori apps, mentioned on NBCnews.com,... I also spend a lot of times doing the marketing (contacting blogs, PR, trailers, web site,…), and sales were very good ! But as soon as it was no more featured by Apple (beginning of October), it dropped very,very fast as you see below. My mission is to release great educational apps that empowers kids and let them experiment freely so that they learn this way. I realized that it is only possible to release one app like this a year because it takes a lot of times to do everything (user experience/design/ development/ graphics/ marketing/updates) . So my strategy is to create a very good app each year, localize it in french (and other market if is not too much work), and also update regularly my existing apps based on the parents’ and teachers’ feedback until I don’t have major requests, and sales are more or less stabilized. This way I can also keep a $2.99 price because of the quality of the app. For example, this year I worked on Word Wizard 3.0 and added a lot of users' and parents' requests such as user profiles, detailed user reports, support for numbers, Australian voice. I could release more “smaller” apps but I’m more interested in building a product I’m really proud of. Like everybody, I have to stay motivated and to stay motivated the more important is to do what you like (of course, you have to balance this with a kind of business model...). Now, it may be a good idea to delegate some works - like marketing and graphics - to create more apps. I love doing artworks but that’s not my best skill, and it takes me a lot of times to create something I like (I think that this year it is was 20% of my time). I don’t like marketing but it’s mandatory, and it is perhaps time to delegate a part of this work. You can find a lot of app marketing articles on the web that explains you how to let everybody know about your new app, and as everybody reports, it takes a lot of times. Basically here is what I do for outbound marketing. You should spend a lot of time on title, icon, screenshots and description because once a potential buyers is on the App Page, it is what make him buy the app or not. So check how successful apps are doing this job. Choosing keywords is pretty difficult, some new services may help you to make your choice (http://www.appcod.es/ https://searchman.com/ ), but there is a lot competition on many keywords nowadays. This is good to be reviewed on blogs because it gives you some visibility (for a short period) and also it allows you to quote the review in your description and PR. Now if you want to be reviewed in a blog, you have to pay for an expedited review because there are too much apps released now. My understand is that having a blog (+ facebook/twitter) takes a lot of times and most of bloggers realized that if they want to continue to spent a lot of their times on this, they need to make money in a way or another - and developers were ready to pay for that. You should also submit your educational app to Children’s Technology Review. It’s not a blog but a magazine that is well recognized in the industry (and it’s free to submit!). You can buy ads on blogs, and it can be helpful to launch an app but don’t expect a good ROI. The issue with ads is that apps are so cheap that you would need a lot of clicks to have a positive ROI, but it’s clear that it cannot hurt and it helps to promote your brand. When you buy an ad, the good thing is that some blogs may also offer you to do a promo codes give away, write an expedited review, or post something on FB which can help to have positive ROI. PR is cheap if you use PRmac.com and it cannot hurt (if you think you need a broader audience try PRweb.com). You can also do some give away and offer promo codes via blogs. You can also organize some contests to offer iTunes Gifts cards (I didn’t do it but it’s a nice way to make people talk about you). A facebook page (and twitter account) is of course a good way to stay in touch with your users but it takes a lot of efforts to get followers. To do it professionally, it really takes a lot of time (which I don’t have), so I just post from time to time news and promos codes. Feedback is really important to make your app better and stay them alive. So in your app you should have a feedback button (in a protected parent zone). But unfortunately not a lot of people will send you an email, but sometimes you will get very good feedback. You should also read carefully the reviews on the App Store and ask all people what they think about your apps. Testing your beta version is now very easy thanks to TestFlight, so try to find some people that can test your app - you won't regret it ! There is also a nice service - reviewfordev.com- that will allow you to get feedback from users on your app or upcoming app (text or video reviews). I tested the service with Word Wizard and a pre-release of Montessori Numbers and the feedback was very useful and detailed (you can choose the type of reviewers you want: parents, teachers, SLPs etc.). Even better, the service has also now partnership with some of the main kids app reviewers so that the reviews will appear on several blogs as well which is really great for marketing. You can also check the app assessment tool at http://betterappsonline.com/. I did the self-assessment for one of my app and the questions were very precise and highlighted some points where my app can be enhanced. I plan to use this feedback more extensively in my next app. They also offer additional services beyond the self-assessment tool to help developers build quality apps but I did not try this yet. It may also be a good idea to meet “real” people. This year, I went to Dust and Magic App Camp (http://dustormagic.com/) which is organized by Children’s Technology review (http://childrenstech.com/). It was very nice and I plan to go back this year. Listening to talks by leaders in the field, and talking with real people make a difference, and I went back very motivated. Twitter is surely a good place to communicate but I don’t have the time to do it - so I can’t really offer my feedback on this. There is no kids category on the App Store, and a lot of publishers use the education category because this is a good category to target parents that buy apps for their kids. There is a games for kids category but it is a sub category and it’s not easy to view this category in the App Store. In addition, in IOS6, Apple added a button to go directly to the education category on the iPad’s App Store main page. So the education category is now filled with a lot games for kids (check how many Toca Boca apps are in the education category) and it is harder and harder to have a good rank in education. But the good point is that Apple features a lot of indie educational apps in the new and noteworthy list, and it helps some us to get some visibility. Apple also provides educational lists (learn to write,...) which are useful for parents. I think it's now clear that educational apps are selling better on iPad, but I don't have hard numbers since Apple doesn't tell developer how many apps are selling on each device and can't really compare. However, the top 10 education on iPhone must be very profitable as well, even if apps are usually cheaper on iPhone. The search algorithm has been updated this year and it now favors free apps. For example, Montessori Crosswords was ranked #1 on “spelling” keyword but now it is only #34 (#8 if you remove free apps). So I think I lost a lot of sales due to the algorithm changes. So now, it seems that a freemium apps would be a better choice if you want to have better ranking in the search results. In 2012, a lot of apps have been released by big publishers like Nickelodeon, Disney and PBS and their apps are of course in the top of the charts (you can’t beat Dora or Mickey). There is also a lot of smaller brands that have their own app (Starfall, Writing without tears,...) and, of course, there are also more small/indie publishers. So more competition, and thus it's harder to enter in the market nowadays. It’s not an exclusive news but it’s always good to know that most of the money goes to a few apps (you can check this on the Montessori Numbers sales graphics when it was in the top 10 edu). So if you have a very successful app it can really be profitable. 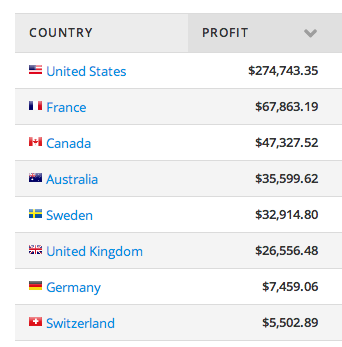 But it is also very nice to see that you can make decent money even if you are ranked #100 in US iPad education. As you can read everywhere, it’s clear that there is less money on Android but there is some (and less competition perhaps). I didn’t want to go on Android because I don’t have the time to do it, but eventually I did a deal with a friend : he did the Android version of Montessori Crosswords and I give him 30% of income (actually it is called Montessori Words because my friend didn’t have the time to do the crosswords section...). I put the app on Amazon and Google and I now sold about 20-30 units a day which is not so bad, but it’s clear that it is not easy to enter the Android market even if you have a successful app on iOS. I’ve been contacted by the guys that do the licensing for Garfield (the cat). They told me that they would love to do a Garfield version of my apps for their not for profit “Professor Garfield” organization. We decided to release a Garfield version of Montessori Words on the Nook because Nook people contacted them to release apps on the Nook - promising them some free marketing. Unfortunately, Nook team did not promote the app and I think we sold less than 50 units so far ! So another lesson that without marketing, your app can be invisible - even if it features Garfield and is based on an app that is successful on iOS. So eventually what do I do everyday ? I think I did spent less time on marketing this year because I was tired of it : Development (30%), Product Definition and User Experience Design (30%), Artworks/Graphics (20%), marketing (15%), Support and everything else (5%). You can check my last year post for details about these activities and more details about my background. OK I think it’s all for 2012. I hope that this information can help some indie devs out there, and let me know if you want more information !